The award winning, record breaking Ai Infinity server is the talk of the industry. Its 8 unique full HD DVI outputs, each with internal EDID management and production & preview connectors are the envy of the competition. 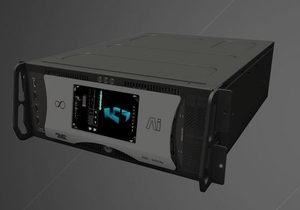 The Infinity server includes many more unique hardware features, such as LTC timecode input, DMX 512 & Artnet output and a front panel touch screen showing the Ai Visualiser. All of these features reduce the requirement for other separate rack mounted products which also reduces the overall project budget and saves on precious rack space. • Smooth playback of multilayer 4K or 8K* media using the AiM Codec. • Up to 4 full 1080p HD outputs (Infinity 4) or 8 full 1080p HD outputs (Infinity 8). • 8 fixture groups x 4 layers = 32 media layers. • Internal EDID Management for each of the 8 outputs. Rear DVI connections are hot swappable! • Integrated front panel touch screen interface. • Soft-edge blending of multiple projectors. • Build and create in the 3D Stage Visualiser. • Map and warp onto any 3D surface. • Video map onto any moving scenery. • Intuitive modular LED support. • Configure multiple systems as Master Slave. • Internet and iPad remote control (via VNC). • Artnet and KiNet output protocols. • Anti Shock & Internal Sub Frame construction. or alternatively 4 x HD / SDI capture inputs. * to enable playback of 8K Media the SSD upgrade option is needed.